You are here: Home / About My Site! 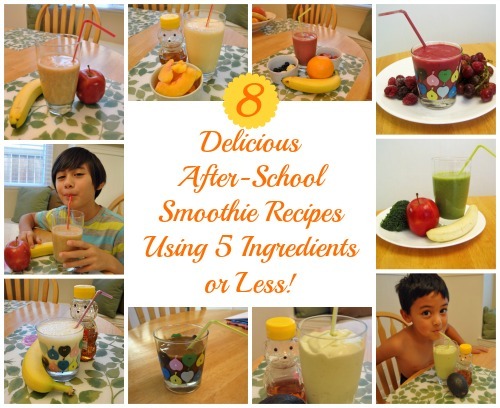 / Babble.com / 8 Delicious After-School Smoothies Using 5 Ingredients or Less! 8 Delicious After-School Smoothies Using 5 Ingredients or Less! If you have a hard time getting your kids to nosh on nutritious after-school snacks, take heart in knowing you’re not alone. Somewhere in the back of my kids’ minds they’re convinced that fruit is reserved for breakfast, and veggies are reserved for dinner. No way! After years of fighting the good fight against processed quick-grab after-school snacks, I finally learned that the easiest way to incorporate nutrition into my little busy bodies is through a smoothie they can grab and gulp on the go. The best part is, I can pack these sneaky smoothies full of nutritious goodness without them ever knowing! Check out these delicious and nutritious kid-approved smoothie recipes made from 5 ingredients or less!